Today we speak with Dale Bunten, Dir. Sales & Marketing at Superb.net. Dale, thank you for taking time with us to speak about your dedicated server offerings. It’s no secret Superb has always been innovating dedicated hosting. My personal favorite is Lease-to-own. FindMyHost currently co-locates servers and it can get very pricey finding colo space and buying hardware. Not to mention hiring technicians who will setup the hardware. That’s why I find this option extremely attractive. Can you give our readers a bit more information on how lease-to-own works at Superb? Sure, as you mention paying a static monthly rate for servers can get very expensive. 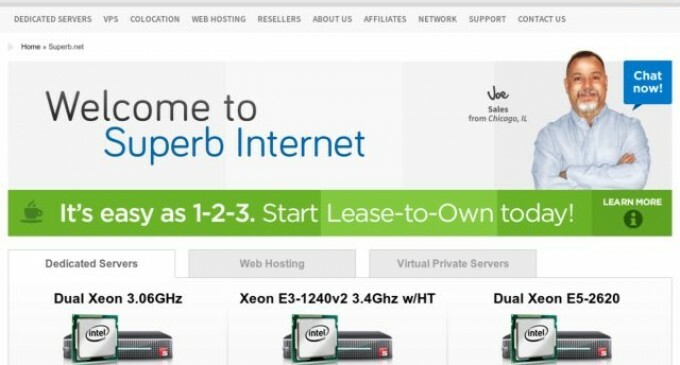 Our lease to own program allows customers to pay an extra $25 per month, so at the end of one year they actually own the servers (we will even ship them to the customer if requested). In year two they essentially pay a $99 /month colocation, power and bandwidth fee since the cost of the hardware is taken out of the equation. This works really well for higher end servers, for example if a customer purchased a $500/m server, that would cost (500×24) $12000 over two years, but with our program it would cost only (525 x 12) + (99 x12) = $7488, as savings of $4512. In addition you also have to add the value of the server itself since the customer now owns an asset that can be sold. What types of Enterprise hosting solutions do you have for dedicated server customers? I noticed load balancing and backup as two that stand out. Anything else Superb offers that might entice Enterprise IT managers? Yes, we offer enterprise class colocation services, where a client would essentially outsource their entire datacenter to us, saving them many 1000’s of dollars rather than running and staffing their own in-house datacenters. We also offer high availability hosting, application hosting, and geographic load balancing, and optimized magento servers. VOIP is hot in the market right now. Can customers host their own VOIP solutions on your dedicated servers? If so, what solutions does Superb offer for customers? We do a high volume of VOIP servers, and we have partnered with several soft switch providers, and have gained expertise in setting up and managing soft switch solutions. How much bandwidth comes with your dedicated offerings? While most customers never use the bandwidth allocated many customers want to be prepared in case their blog or site gets picked up by a popular blogger or by DIGG. We just launched 10TB, for all servers! In fact we have a crazy 15 year anniversary promo going on right now where you can get 70% off select dedicated servers here www.superb.net. With IPv6 on the very near horizon, is Superb prepared for IPv6 networking for its customers? Of course we are very aware of the situation and are working to provide this in the near future.